Branch speaks with panelists during the question and answer portion of the Women In Entrepreneurship panel. Alexis Branch, a student and SGA president, released a letter initiating a petition to remove LeRoy Summers Jr., Vice President of Business and Finance, following the institution’s struggle for accreditation. “Mr. Summers has continued to fail to keep the board properly abreast and his insight, or lack thereof, has resulted in the college’s current accreditation status,” Branch included in the letter. The petition has accumulated 251 supporters out of the goal of 350. The college has conducted an investigation of Summers. Administration informed Branch of Summers’ administrative leave throughout the conduction of the investigation, according to another letter written by Branch. Please note that this action is not done on behalf of SGA Executive Board at Bennett College. This petition was drafted by a student who happens to serve as the SGA President. Some Belles are against the petition Branch released. In the midst of her petition, Branch released a statement to address another paper petition created by a SGA leader, which called for the removal of Branch as SGA president. “Should you feel that I am no longer a voice for you, I respect your voice enough to not try to silence you in signing the petition,’ said Branch. Commission (SACS) due to the rejection, and temporarily restored their accreditation while the trial continues. 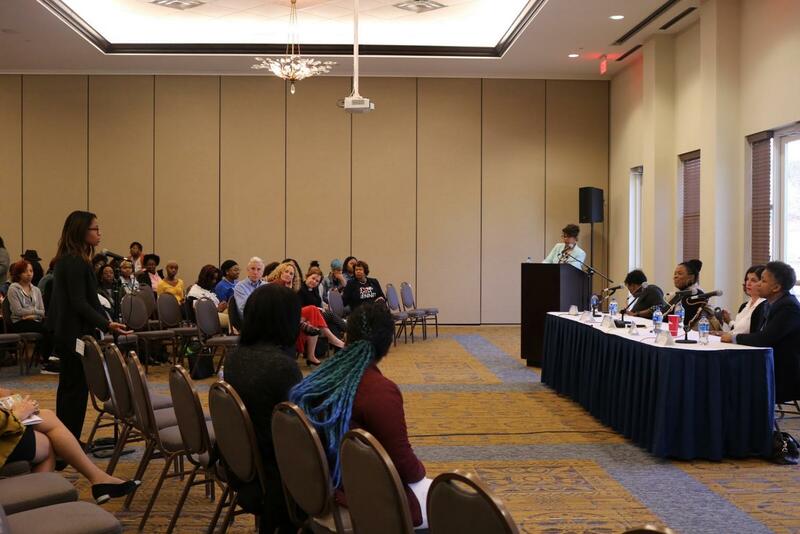 “The appeals committee found that Bennett College had ‘failed to show that the institution possesses resources demonstrating a stable financial base to support the mission and scope of programs and services,” the SACS news release stated. 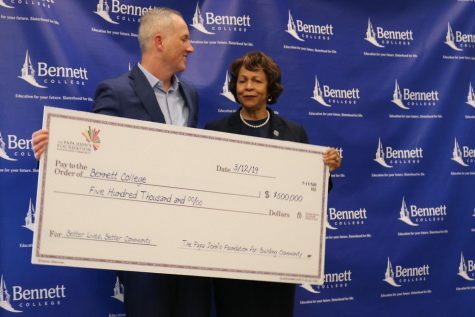 Over two weeks later, company CEO of Papa John’s, Steve Ritchie, formally presented Bennett College with their $500,000 donation check for their #StandWithBennett campaign on March 12, 2019. At the press conference following the panel, Ritchie announced The Papa John’s Foundation for Community Building, in which Bennett College would be the first grant recipient. The foundation has also partnered with the Boys and Girls Club, Lean Into Louisville and the Association of American Colleges & Universities, and promises to “support communities as they work together for equality, fairness, respect and opportunity for all,” according to its website. Ritchie says he wants this partnership to foster a healthy relationship between Papa John’s and Bennett College, with talks of leadership and students hopefully visiting the Papa John’s campus in Louisville, KY and potential internship and scholarship opportunities. The company also hopes and plans to partner with other Historically Black Colleges and Universities in the future. “I love what we’ve discovered here at Bennett and I’m actually hoping it inspires the other HBCUs to give me a call. We think there’s real opportunities here to expand many HBCUs in the country,” he said. Bennett’s current president, Dr. Phyllis Dawkins, appreciates the decision of Papa John’s to develop a relationship with the institution. Dawkins also confirmed plans of development for partnerships and re-engineering team to help re-imagine Bennett. “We’re going to look at our business practices, look at how we can grow endowment, our scholarship base and just fundraise so that we’re never ever in this position again,” said Dawkins. Calling for the removal of Summers and expanding its partnership with Papa John’s are examples of how the private college is controlling their situation. “The time for staying in the shadows ends with each of us,” said Branch. Ritchie, presents Dawkins, with their $500,000 grant check.